Platinum music producer Collin "Jugrnaut" Dewar and former LOUD Records A&R Michael “Mike Trauma D” Dewar (collectively known as Arkatech Beatz), are launching an independent entertainment company - Arkatech Beatz Entertainment (A.B.E). Arkatech Beatz are best known for their A&R/production with Grammy nominated Hip Hop artists Big Pun, Nas, Wu Tang Clan, Mya, The Game, Meek Mill, Waka Flocka, Killer Mike, Jadakiss, and a long list of others. Arkatech Beatz Entertainment devotes itself to artist expression, development, and growth while establishing a solid foundation for current and future talents. 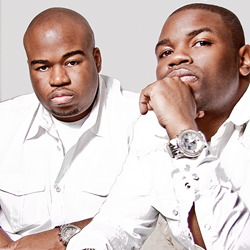 Platinum music producer Collin "Jugrnaut" Dewar and former LOUD Records A&R Michael “Mike Trauma D” Dewar (collectively known as Arkatech Beatz), are launching an independent entertainment company based in Atlanta called Arkatech Beatz Entertainment (A.B.E). Arkatech Beatz are best known for their A&R and production with Grammy nominated Hip Hop artist Big Pun and has worked on projects with notable artists such as, Nas, Wu Tang Clan, Mya, The Game, Mobb Deep, Max B, Shawty Lo, Waka Flocka, Jadakiss, and a long list of others. “Over the years we’ve come in contact with a wide variety of new artist specifically looking for mentoring, production, and artist development. Mentoring and artist development are areas the big record companies do not always spend time doing.” says Mike D.
“With A.B.E we will concentrate on these areas along with offering an assortment of artist services to ensure artists are fully equipped with the tools needed in building a long lasting career in the entertainment business. A.B.E devotes itself to artist expression, development and growth while establishing a solid foundation for current and future talents.” says Collin. A.B.E has already partnered singer/songwriter/actor Sean Baker who has been in featured in co-starring roles on the CW’s “All American”, BET’s “Tales”, & “All Eyez On Me”. Other additions are Atlanta rapper/Duct Tape Ent affiliate Pesh Mayweather, and new signee music producer Nova. With new projects on the way, A.B.E is looking to utilize its experience and expertise to take the industry by storm. With more than 20 years of experience, Arkatech Beatz is a Grammy nominated music production team from New York, currently in Atlanta. Arkatech Beatz were affiliated with Loud Records/Sony Music Entertainment as A&R executives, and have composed, written, and produced music for gold and platinum selling artists such as Big Pun, Nas, Wu-Tang Clan, Prodigy of Mobb Deep, Mýa, Waka Flocka Flame, Jadakiss of The Lox, and many others. If you would like additional information about this topic, please call William Alexander at 404-969-5580, or email at info@arkatechbeatz.com.